Author, historian and cyclist Peter Joffre Nye appeared on Bike Talk Radio on 27th February 2011. Peter has published six books on cycling, written a documentary script, freelanced articles for 10 years for Winning Magazine, published articles in more than 100 newspapers and magazines, including Velo-News, Sports Illustrated, The Washington Post, USA Today. Peter has served on the board of the U.S. Bicycling Hall of Fame since 1988. CyclingRevealed.com thanks Peter for allowing us to re-publish his tremendous story of American cycling pioneer Joseph Magnani. “If anyone knows who he is or where he came from to represent America, we would like to hear about it,” wrote Otto Eisele, secretary of the Amateur Bicycle League of America (predecessor to the U.S. Cycling Federation and USA Cycling, Inc.), in American Bicyclist, then the only national cycling publication. Magnani stood 5 feet 11 inches. The French press described him as thin and strong. Photos (above) show him looking trim, with his dark hair parted in the middle and combed back in the day's fashion. Two dozen French bicycle manufacturers such as Urago, Peugeot, Terrot, and Automoto each supported a trade team to help promote their products. Several hundred aspiring riders competed for berths on the teams. “Getting a contract to race for one of the pro teams was tough,” said his wife. In 1935 Urago Cycles offered Magnani a coveted pro contract. As an American expatriate, he was required to obtain a license from the American governing body, the National Cycling Association, based in New Jersey. Magnani wrote to the NCA and received back his license, issued by America’s long-standing national sprint champion Frank Kramer. America had several sprinters who went to compete in Europe, but Magnani became the only American racing on Europe’s roads. 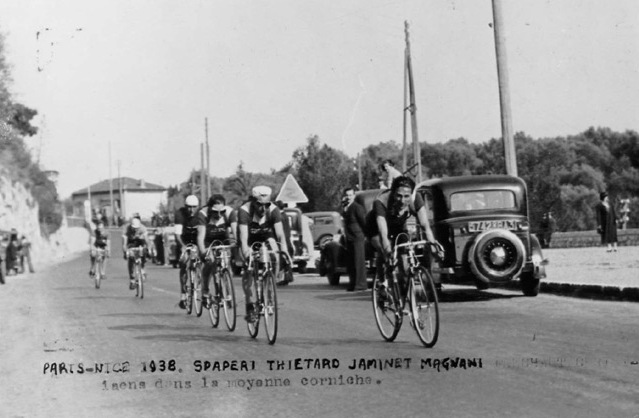 At the top of bicycle racing then, as now, loomed the three-week Tour de France. 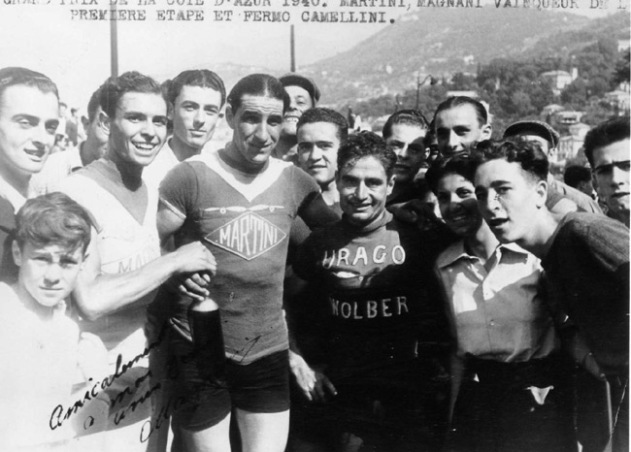 Unlike today's format with trade teams composed of international riders, the Tour in Magnani's era involved national teams. That format excluded Magnani, the lone U.S. road rider (several other U.S. riders competed in Europe, but chiefly on the tracks). Magnani's performances, however, earned him consideration to ride the Tour de France on an international composite team, recalled Al Stiller of Boulder, Colo., who worked at Schwinn with Magnani. “But a Canadian who came up with more money bumped him off the team,” Stiller said. For the 1939 season, Magnani left Urago to join another French pro squad, Terrot. In the spring, he won the first stage of the 11-stage Tour of Southeast France that covered 1,250 miles. That put him in the race leader’s blue jersey. He also scored a third place in the third stage. But after the first week he lost the lead and finished seventh overall. At age 27, he had only begun to reach the top of his game. Then Germany invaded Poland. War erupted, and the world championships scheduled that year in Italy were canceled. War hostilities intensified globally. On December 7, 1941, the Japanese bombed Pearl Harbor; the U.S. Congress promptly declared war. Magnani had signed to race the 1942 season on France-Sport, a big professional team with greater resources at his disposal than ever before. His team mates included Rene Vietto and Dante Gianello, two of the period’s biggest names. 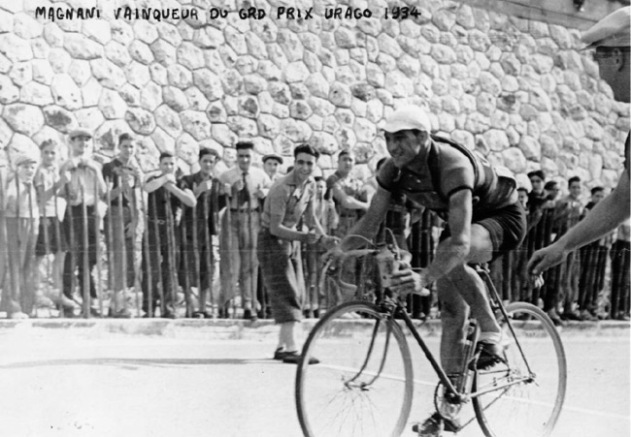 Despite wartime hardships, Magnani traveled with his teammates to races in the southern half of France. As an American in France during German occupation, however, Magnani became a marked man. After U.S. and English troops landed in North Africa in November 1942 to fight the German troops, German troops in northern France moved into southern France. After U.S. and British troops launched the Normandy invasion on France’s northwest coast in June 1944 and weeks later liberated Paris, Magnani and others were set free. Magnani joined his wife after more than two years of incarceration. When their son was born in July 1945, they named him after Joseph's youngest brother, Rudolph. According to Veneziano, Magnani rode support for Camellini, who wore the race leader's pink jersey during the second week. Then Magnani fell heavily in a crash. “He banged up his knee and couldn't race because of infection, so he came back home to recover,” said his wife. 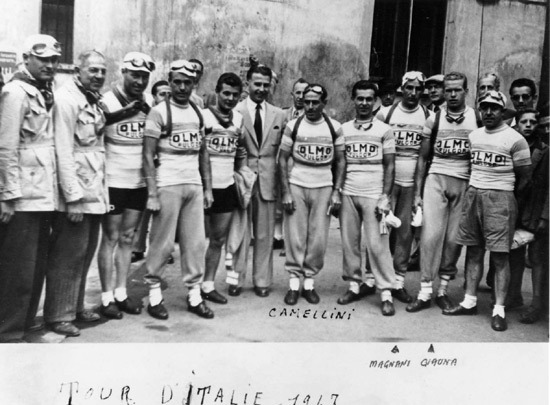 Camellini couldn't defend the leader's jersey as Coppi and Bartali dueled, with Bartali ultimately triumphing. “Joe Magnani was a remarkable technician,” observed Richard Schwinn, a fourth-generation bicycle manufacturer and former company vice-president who saw Magnani in action on the job. 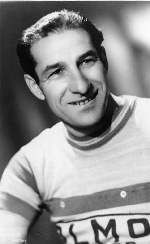 Magnani's coaching helped Masanek win the 1949 Winnipeg-Kenora race of 150 miles. “I wore my Urago jersey and pedaled my Urago bike,” Masanek said. In one-hour team races that enjoyed popularity at the Brown Deer Park track in Milwaukee and Washington Park track in Kenosha, Masanek and Stiller competed together while Magnani coached from the sidelines. “Joe helped us as much as he could with tactics we might use, how we looked,” Masanek said. “He gave us water." In the early 1970s, despite his athletic talent, Joseph Magnani was overtaken by a debilitating neural affliction. “My dad had always been active, quite vigorous in fact, and not being able to get around because of illness depressed him,” his son said. Magnani died November 30, 1975. Highlights of Joseph Magnani’s professional career. Compiled by the editors of Coups de Pedals 67, published in the July-August 1998 issue.